It’s nice to be at home with DH, my kids, Mom and sister for this election holiday. Redge and I spent few hours shopping and preparing our special food for the day. We made macaroni-fruit salad and cooked our favorite ground pork menudo with veggies. I missed cooking special foods for my family as my work schedule became a 6-day work week and even though the last work day is only a half day my time is not enough to prepare special dishes and desserts. Anyway the kids are on their school break already and their schooling will resume next week so it’s a good time to cook their favorites. We made a kilo of salad to sustain us for 2 or three days enough for the kids’ vacation and before the next Nov. 1 holiday. 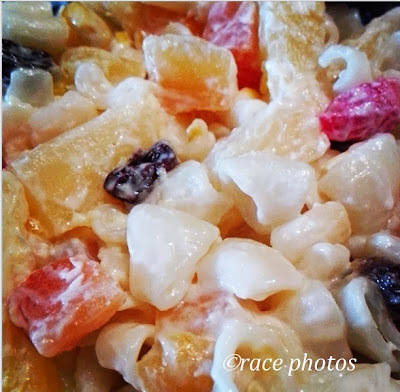 We actually experimented on our mixture of ingredients for our combined fruit and macaroni which is both healthy and sinful for our diets. The kids love it and complained of over eating the dessert lol. The day is so relaxing and even gave me some nappy time to give me enough energy for my night online work. It almost made me forget that I have to visit this site that my brother needs for his construction business. Wish I can spend a holiday without a work but I’m thankful that I have many blessings of work.